Summer is the season for picnics at the park, taking in the sunshine, enjoying the fresh air and letting the kids run off their boundless energy. Picnics are also the perfect opportunity to let your kids hone their kitchen skills by giving them the mission of prepping the family's picnic fare. Here are a few of ChefMom's favorite picnic recipes that the kids can make. My son loves using the melon baller to extract perfectly round balls of juicy cantaloupe, watermelon and honeydew from their rinds. 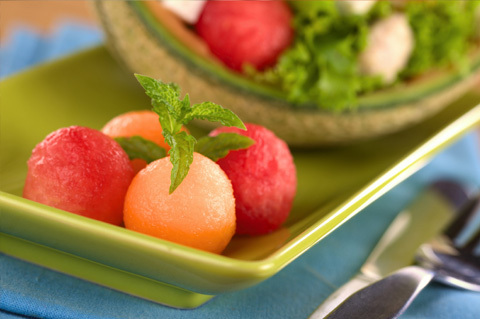 Hand your kiddo a melon baller and you'll have this salad ready-to-go in minutes. Serve it alongside the sandwiches as a picnic side dish or as a refreshing, healthy dessert. Have your kids combine all ingredients in a large airtight container. Keep refrigerated until ready to pack. Hummus is one of the easiest picnic recipes for your kids. Simply put all the ingredients in the food processor and blend. The addition of smoky almonds will give your kids the makings of a signature dish they can proudly whip up all year round. Help your kids measure out the almonds, yogurt, lemon juice, tahini and cumin, placing each in the bowl of a food processor or blender. Have them add garbanzo beans and garlic. Cover bowl and purée on high speed. If hummus is too thick, add a bit more yogurt and blend again. Let your kids transfer the hummus to an airtight container and place in the refrigerator until ready to pack. Serve hummus with crackers or chips. A rotisserie chicken turns a time-consuming dish into a quick and simple endeavor for your kids. You'll have to help the younger kids with the chopping but older kids will get a chance to sharpen their knife skills. Let your kids combine the chicken, parsley, basil, celery, cranberries, almonds, green onions and orange zest in a large bowl. Have your kids whisk together the orange juice, honey mustard and mayonnaise in a small bowl. Season with salt and pepper and whisk again. Let your kids pour the mayonnaise mixture over the chicken mixture and stir to combine. 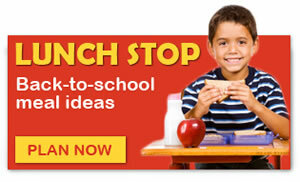 Have your kids spoon chicken salad onto six slices of bread and top each with a lettuce leaf or sprouts. Place remaining bread slices on top and place sandwiches in individual sandwich bags.